2 How to get rid of warts at home? The one thing that depresses you, having warts on your body. Even a single wart also seems very nasty when it appears on the face. Since warts occur due to a virus, it spreads to anywhere in the body. Hence, it’s necessary to cure this virus at an initial stage. Therefore, to get rid of Warts, know the natural Warts home remedies from below. Warts appear due to Human Papillomavirus(HPV). It is the most prevalent skin problem that can occur in any part of the body particularly on hands and feet. The warts skin becomes dry, and they exist either single or in the form of groups. Warts have different types. Most common types of warts are plantar warts, flat warts, common warts. Common warts look like dome shaped and gray-brown and commonly occur on hands. Planta warts are hard and thick with dark spots occur on the feet, toes. Flat warts will grow on the arms, legs, and face. These are very small with flat tops and look either yellow, brown, or pink colors. Filiform warts generally occur on mouth, chin, nose. The color of those warts is same as skin color. Periungual warts especially appear around the nails of fingers and toes. 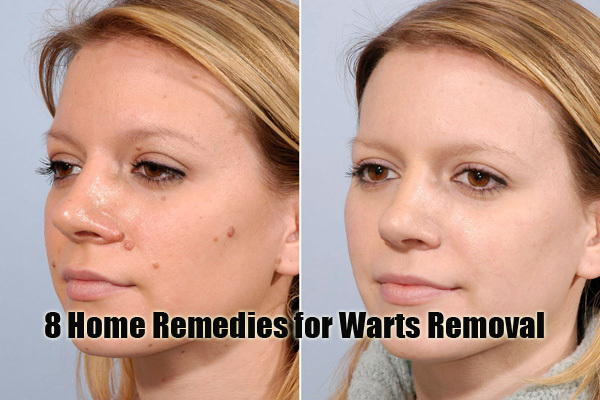 To get rid of warts, look through the below natural warts home remedies. Garlic is an excellent home remedy for the Plantar warts. 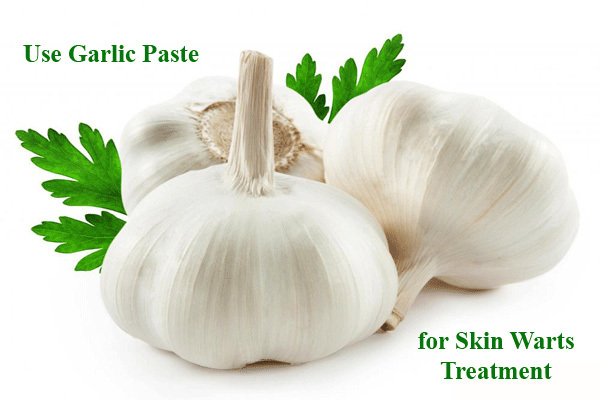 Fresh garlic is a great solution for warts removal at home. Garlic has antifungal, antibacterial, and antiviral properties which can fight with several viral infections. It contains a chemical substance called allicin which shows a positive result in treating warts. First take a garlic clove and rub onto your skin to check whether your skin is sensitive to garlic or not. Because some people will get rashes for garlic and causes irritation. You can also use garlic juice for rubbing. Studies proved that garlic is best for facial warts treatment. Know other uses of garlic. How to get rid of Warts Naturally with Garlic? First, Crush the garlic cloves and apply it on Viral Warts and then cover it with a cloth. Left undisturbed for about 20 minutes and then clean the surface thoroughly. Repeat this Wart treatment home remedy twice a day and for a week. But larger warts takes a longer time to heal warts. Note: Since the garlic has a pungent smell, if you don’t like it, take garlic capsules three times a day. How to get rid of Warts Naturally? The most successful treatment for flat warts removal is rubbing banana peel. The antioxidant properties of banana peels cure the human papillomavirus and hence the remove the HPV Warts. The oils and chemicals in banana peels boost your immune system to fight with HPV virus that causes different types of Warts. How to get a wart off with a banana peel? Cut enough piece of banana peel to cover the warts. For better and fast results, prefer green banana peels instead of ripe bananas. Do this facial wart remover especially at night to gain instant results. Besides, You can also rub the banana peels on the skin warts. Repeat this Warts treatment for several days to get off warts. Read more benefits of banana peel. 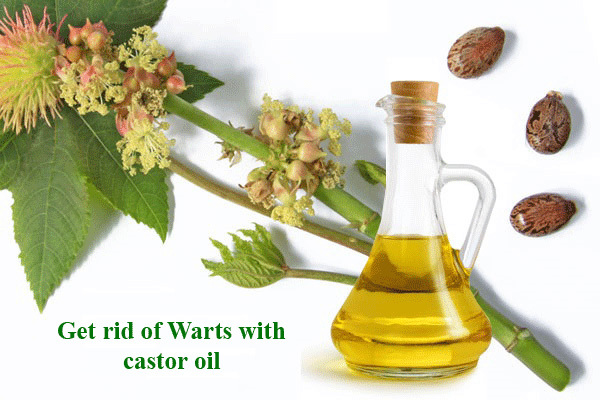 Among the Natural warts home remedies, castor oil is one. However, Castor oil contains ricinoleic acid is effective in healing Plantar Warts. The anti-inflammatory and antibacterial properties of this acid cure genital Warts on hands, legs, face, feet, fingers, toes. Also, check how castor oil treats dry eyes. How to remove Warts using castor oil? Apply castor oil on your genital warts for a few times in a day. Make sure that these skin tags soak in castor oil or not. In the night, before you sleep, dip a cotton ball in castor oil and place it on the warts. Tape at this part. The very next morning, remove the cotton ball and clean with warm water. Use this natural wart remover for several days for treating Warts with no pain. The cheap and best home remedy for Warts removal is a potato. Raw potato is not only best for whiteheads & dark circles only but also treats Skin moles. From olden days many people stuck to this solution since it has great success results. Also, worthy too. Made potato into slices by peeling off it. Rub the slice on the verruca warts for a few times in a day. Also, you can bandage this slice on warts and left it undisturbed for some time. Do this wart removal procedure for several days until all the warts will disappear. Hot water helps to soften the Warts quickly. Also, hot water soak will remove HPV virus and prevents infections that cause Warts. Either hot water alone is beneficial or adding some amount of vinegar & Epsom salt makes it work more effective. Hence, hot water soak is one of the best natural warts home remedies. But make sure that the water must not be too hot to avoid burning of the skin. Do you know Milkweed, the roadside plant is a great medicine to remove pictures of Warts? This herb consists of escharotic, expectorant, laxative, carminative, anti-spasmodic properties. From all, the escharotic properties are very useful for infected mosaic warts cure. It is a substance that has astringent properties that help to heal skin warts speedily. The main ingredient in milkweed is sap which looks like milk is effective for finger warts removal. Hence, milkweed is one among the natural warts home remedies. How to naturally remove warts with milkweed? Clean the area with warts and use a pumice stone to rub gently on your wart. Break the milkweed leaves and squeeze the sap which is in milk form. Apply this milk sap on all your warts on face, lips, hands, toes, etc. Leave it for some time and then wash them with warm water. Remember: If you find any itchiness and rashes, don’t use this milkweed for further. Also, place this away fro kids since it’s sap is poisonous. The virus healing capability of basil leaves made it as one of best natural warts home remedies. Holy herb, Basil has antibacterial and antiviral properties which are helpful for healing any viruses. Like that, when you place this basil leaves paste on facial warts, it treats HPV warts quickly and also prevents them coming back. Crush a handful of fresh basil leaves to extract juice. Apply this juice to warts and then cover with either a clean cloth or bandage. Besides, crush these leaves little and put this mixture on your warts and left undisturbed for some time. It takes about one week to cure skin warts disease. Studies found that fig tree latex is best for removing warts due to its proteolytic activity. However, of all the benefits of figs, especially have a separate role in treating plantar warts on hands. The latex or sap of figs contains antibacterial and antiviral properties. Hence, application of this latex cures all the warts on body. How to treat facial warts at home using fig sap? Take a leaf from a fig tree. Squeeze the bottom in which you can see a thick white liquid. This is a sap of fig tree which is also called latex or milk. Apply this milk on your body warts. Within a few minutes, this liquid will dry out and appears as a glue-like substance. Repeat this home remedy for twice a day. It takes about 7-10 days to burn out all plantar and flat warts. Within a short time, the wart will appear darker and will fall off. Precaution- Don’t use fig milk on your face, particularly around your eyes. 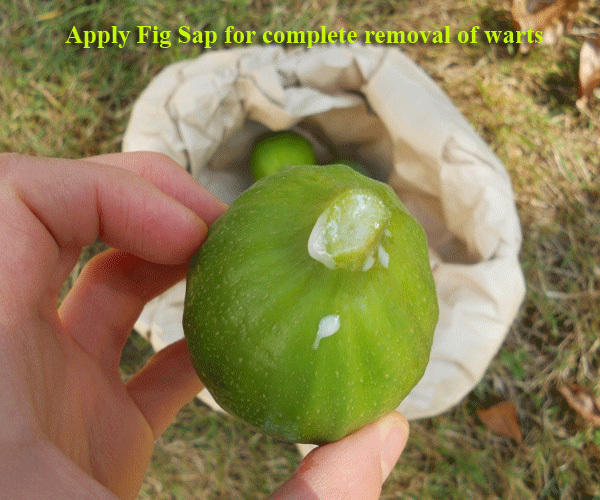 But you can use this fig sap to treat warts on your feet, ears, fingers, neck, hands, etc. Know more about figs uses. Along with home remedies for warts, there are also some natural ways to get rid of verruca warts on fingers. For fast wart removal at home, take a single hair and tie this around a wart. Don’t remove this hair. After 2 or 3 days, your wart will be removed automatically. This is a painless and natural remedy to get rid of warts at home. Pineapple juice is not a delicious fruit but also a great remedy for plantar warts cure. The acidity content and the enzymes present in pineapple juice eats the wart’s skin and hence all the warts will be cured. Due to acidic nature, vitamin C works great for viral warts removal. Hence, apply vitamin C composition on skin warts by dissolving 2 or 3 tablets in a little amount of water. Instead of going to warts removal products, use these home remedies to get rid of warts for best results. Often, these natural remedies are completely free from side effects and cost-effective. In fact, these are painless also.